A US team, writing in the Lancet , looked at mortality figures from 2010. They found two-thirds of the 7.6m children who died before their fifth birthday did so due to infectious causes - and pneumonia was found to be the leading cause of death. One expert said it was very important to "translate such findings into action". They found child deaths had fallen by two million (26%) since 2000, and there have been significant reductions in leading causes of death including diarrhoea and measles - as well as pneumonia. 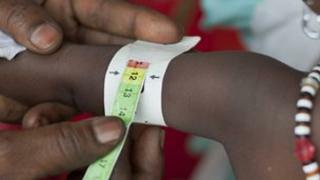 Half of child deaths occurred in Africa - two thirds (2.6m) were due to infectious causes, including malaria and Aids. The researchers warn that very few countries will achieve international targets for improving child survival - the Millennium Development Goal (MDG) 4 - by the 2015 deadline. Writing in the Lancet, the researchers say: "Across all the previous and current rounds of causes of childhood death estimation, pneumonia and pre-term birth complications consistently rank as the leading causes at the global level. "Africa and South East Asia are repeatedly the regions with the most deaths in children younger than five years. "Our trend analysis shows that accelerated reductions are needed in the two major causes and in the two high-burden regions to achieve MDG4 by 2015."